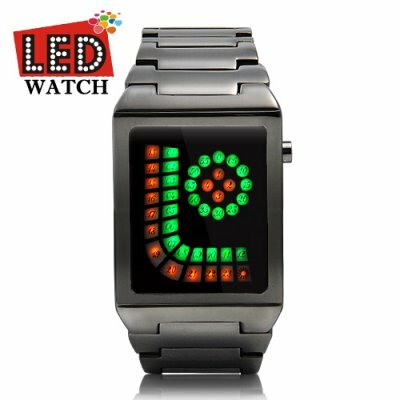 Successfully Added Combinator - Green Orange Japanese Style LED Watch to your Shopping Cart. Introducing our most powerful Japanese LED watch yet - The Combinator Green Orange Japanese LED watch from Mahiro Maeda's Second Renaissance timeline which gives its wearers the ability to absorb and wield gamma as well as cosmic radition in all its forms including the Power Cosmic used by the planet eater Galactus! You mean this watch really tells the time? Yes. Even though The Combinator brings together Noir Sabbath generals gathered at their masses design with Ferrum Maiden soldier blue in the barren wastes style in the much the same way Keanu Reeves as Constantine brought his forearms together to complete the Red King tattoo in order to summon the angel Gabriel, this green orange Japanese LED watch does in fact tell the time and does so really efficiently too! Tap the top button on the right side of the timepiece and watch the screen come to life like Doc Brown powering up the DeLorean DMC-12! In time mode, the orange and green curve represents the hours from 13-24 and 1-12 respectively while the outer green circle represents 5 minute slices and the inner orange circle represents 1 minute intervals. In date mode, the green curve represents months 1-12 while the outer green and the inner orange circle represent 5 and 1 day segments respectively. To access change mode, simply insert a sharp point into the lower recessed button and then press the top button to toggle different values. In fact, when you start wearing this watch you may find that the angrier you get, the more powerful you become. There is a scientific explanation for this, but it's a really geeky one. No seriously, I'm warning you...if you continue to read about the origins of the Combinator you will literally experience geek overwhelm and end up buying your jeans where you buy your pop tarts. OK. It's your life. Here goes. The Combinator was jointly created by two of the most evil supervillains in the Marvel Universe namely The Leader and M.O.D.O.K. (Mobile Organism Designed Only for Killing). At the time, the two individuals along with other members of the master criminal organization Intelligencia were looking for ways to do away with the Incredible Hulk once and for all. Based on knowledge gained from Alexander The Great's lost archives, The Leader and M.O.D.O.K. developed an arm bracelet which could absorb both gamma and cosmic radiation and infuse them into its wearer -- a yet to be named Hulk nemesis. It was by means of the Combinator that the creature known as The Red Hulk (or Rulk for short) was created. Scott Pilgrim and Gladys Knight (sans Pips) are said to be Combinator owners, as are Hugo Weaving and Sigourney Weaver. In reality, this watch is perfect for LOST fans who can recite at least 20 nicknames Sawyer gives to the other cast members, Incredible Hulk fans who can recite at least 10 nicknames the green giant gives to other superheroes, and anyone who knows all the lyrics to Big Fun by Detroit House pioneers, Inner City. If you're looking for the perfect Geek gift whether for your boyfriend, IT guy, or Reddit friend - you can't go wrong giving that special someone a Japanese LED watch. You mentioned that this watch is perfect for LOST fans who can recite at least 20 nicknames Sawyer gives to the other cast members, Incredible Hulk fans who can recite at least 10 nicknames the green giant gives to other superheroes, and anyone who knows all the lyrics to Big Fun by Detroit House pioneers, Inner City. What if I don't belong to one of these groups?